Mandalay Bay Resort & Casino is one of the most well-known resorts in the United States. The 43-story resort features 3,309 hotel rooms, a 135,000 square foot casino, over 25 different restaurants, a variety of nightclubs, and its very own beach. Designed with a tropical theme in mind, Mandalay Bay takes guests on a journey of luxury and relaxation. The On The Scene team has produced a variety of corporate events and meetings in Las Vegas over the years, and we’re very familiar with all of the top event venues in the city. Mandalay Bay is one of our favorite Las Vegas event venues, due to its versatility and wide range of event spaces. We have the experience necessary to offer advice on which event spaces within the resort are right for your particular event, and will work with you every step of the way to ensure your event is one attendees will never forget. Mandalay Bay is home to one of the largest meeting facilities on the entire Las Vegas Strip. Offering over 2 million square feet of versatile event and meeting space, it is the perfect setting for your upcoming corporate event. Whether you’re planning a multi-day program for thousands, or a dinner for a few hundred, Mandalay Bay Resort & Casino has the right event space for group. Mandalay Bay Convention Center – Comprised of two convention centers, North and South, the Mandalay Bay Convention Center offers two exhibit halls, a food court, a business center, a variety of ballrooms, and over 100 meeting rooms. No matter the size or scope of your event, the convention center has all you need to make a lasting impression on attendees. Mandalay Bay Events Center – Offering 40,115 square feet of event space on the concourse level and 30,218 square feet on the event level, this 12,000 seat arena is ideal for large-scale events, such as meeting kickoffs, welcome receptions, or a concert for attendees. 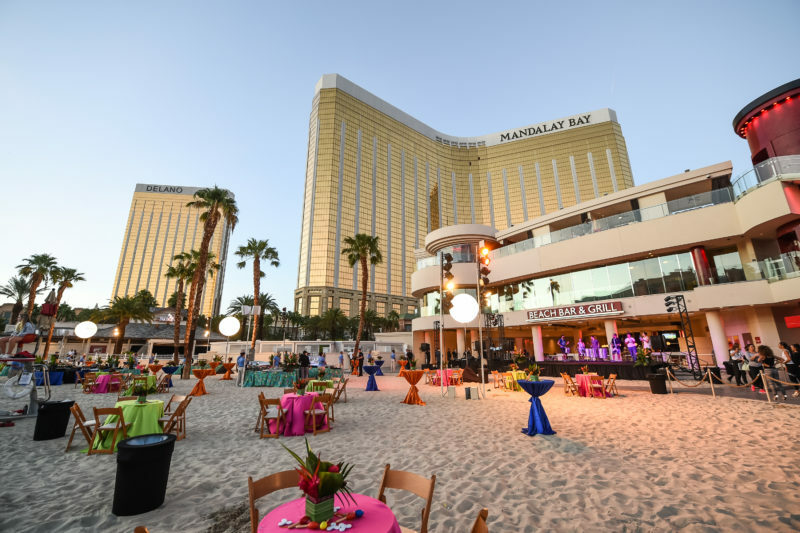 Mandalay Bay Beach – Take attendees to the beach for a night of fun, entertainment, and networking! 11 acres of sand make this a unique setting for your next outdoor event. Shark Reef Aquarium – This 1.6 million gallon aquarium features more than 2,000 animals and 15 different species of sharks. Give guests an experience like no other in this stunning venue that can accommodate up to 1,500 guests. Seascape Ballroom – Located within the Shark Reef Aquarium, this ballroom offers 1,675 square feet of event space and can accommodate groups of up to 100. It also features four large windows that give a breathtaking view of the aquarium. 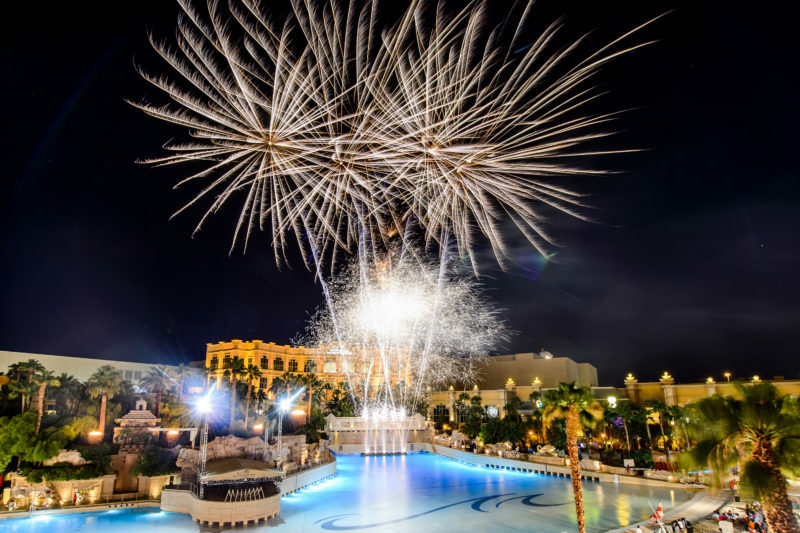 On The Scene is a an award-winning Las Vegas event management company with years of experience producing a wide range of events for clients in a number of industries. From multi-day programs for leading pharmaceutical companies to intimate dinners for media management companies, we’ve done it all! We are committed to producing one-of-a kind corporate events and work with you every step of the way to learn your company culture, brand, and event goals. We offer a variety of event solutions, including: transportation, team dining, tours & event activities, and event entertainment. If you’re interested in hosting your upcoming meeting or event at Mandalay Bay Resort & Casino in Las Vegas, contact us today! We’ll become an extension of your team to bring your vision to life!